All in all this deluxe edition of The Hangover is well worth the money and well worth the time it will take to watch all the excellent bonus features. Anyone who is anyone should go out and pick up this movie. Who hasn't seen The Hangover? It was a surprise hit of 2009 and went on to become one of the most celebrated comedies in movie history. Who would have thought that a movie about 4 guys who go down to Vegas for a bachelor party, lose the groom, and spend the rest of the movie trying to find him would become as popular as it did? There are even rumors of a possible sequel, though how that could be pulled off is anyone's guess. Naturally, once it was released to DVD it was only a matter of time before it got the Blu-ray treatment and not long after that until a deluxe edition hit stores with loads of extra materials. That's what we have here with The Hangover: Extreme Edition. The movie itself looks so crisp through the eyes of Blu-ray though that isn't too much of a surprise considering how well Blu-ray looks on the right screen. Equally good is the sound quality of the movie if anything you may end up turning the sound down at certain points because it comes off so clear. The deluxe edition boasts two discs. The first being a soundtrack sampler featuring five songs from the movie; the hangover theme song, "Stu's Song" performed by Ed Helms, "Who Let The Dogs" out by the Baha Men, "Stupid Tiger" by Chris Beck, and "Candy Shop" by the Dan Band. Disc 2 features the unrated and theatrical versions of the movie as well as a picture-in-picture commentary with the stars and director but only on the theatrical versions. A map of destruction following the path the boys took on the night out. Each stop gives you some local history about the place as well as footage of the actual filming. There is a improve sketch featuring Ken Jeong, also a compilation of all the physical comedy from the film. You can re-live the "Three Best Friends" song from the movie, this time with as a freestyle version. If you really liked the cover of the song Fame by the wedding band than you can watch that as well. There is a gag reel, and of course more pictures from the missing camera. 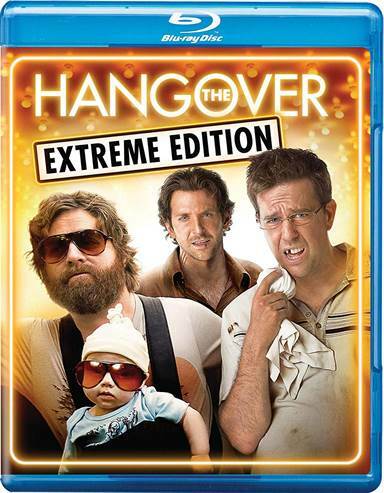 Download The Hangover Extreme Edition from the iTunes Store in Digial HD. For more information about The Hangover visit the FlickDirect Movie Database.